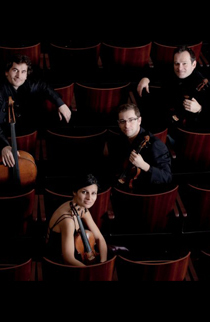 The Belcea Quartet has gained an enviable reputation as one of the leading quartets of the new generation. They continue to take the British and international chamber music circuit by storm, consistently receiving critical acclaim for their performances. The Quartet was established at the Royal College of Music in 1994 and has since been coached by the Chilingirian, Amadeus and Alban Berg Quartets. They are the Associate Ensemble at the Guildhall School of Music and Drama, London and are Quartet in Residence at the Atheneum Concert Hall in Bucharest. The Belcea Quartet has an exclusive recording contract with EMI Classics and won the Gramophone Award for best debut recording in 2001. Subsequent recordings for EMI include Schubert quartets, Brahms’ String Quartet Op.51 No.1 and second String Quintet with Thomas Kakuska, Fauré’s La Bonne Chanson with Ian Bostridge, Schubert’s Trout Quintet with Thomas Adès and Corin Long, a double disc of Britten’s string quartets, Mozart’s Dissonance and Hoffmeister quartets, and, most recently, the complete Bartók quartets, for which the Quartet was awarded the title Chamber Music Ensemble of the Year by Germany’s prestigious Echo Klassik Awards and nominated for a 2008 Gramophone Award. The Belcea Quartet’s international engagements regularly take them to the Vienna Konzerthaus and Musikverein, Amsterdam’s Concertgebouw, Brussels’ Palais des Beaux Arts, Lisbon’s Gulbenkian, Zurich’s Tonhalle, Stockholm’s Konzerthuset, Paris’ Chatelet and Opera Bastille, Milan’s Sala Verdi, New York’s Carnegie Hall and Lincoln Center and San Francisco’s Herbst Theatre, and to festivals including Luberon, Istanbul, Trondheim, Lausanne, Salzburg, Mecklenburg, and the Schwarzenberg Schubertiade. In the UK they regularly appear at the Edinburgh, Aldeburgh, Perth, Bath and Cheltenham festivals, and at the Wigmore Hall where they were resident Quartet from 2001 to 2006. They regularly work with leading instrumentalists including Thomas Adès, Isabelle van Keulen, Michael Collins, Paul Lewis, Imogen Cooper, Yovan Markovitch, Natalie Clein, Piotr Anderszewski and Valentin Erben. Recent collaborations with singers have included performances of Mahler’s Des Knaben Wunderhorn with Ann Murray and Simon Keenlyside; Schoenberg’s String Quartet No.2 and a new commission by Joseph Phibbs for string quartet and voice with Lisa Milne at Wigmore Hall; Fauré’s La Bonne Chanson with Anne Sofie von Otter at the Cité de la Musique, Paris, Respighi’s Il Tramonto with Angelika Kirchschlager at the Langeland Festival and with Ian Bostridge at New York’s Zankel Hall and Washington’s Library of Congress.